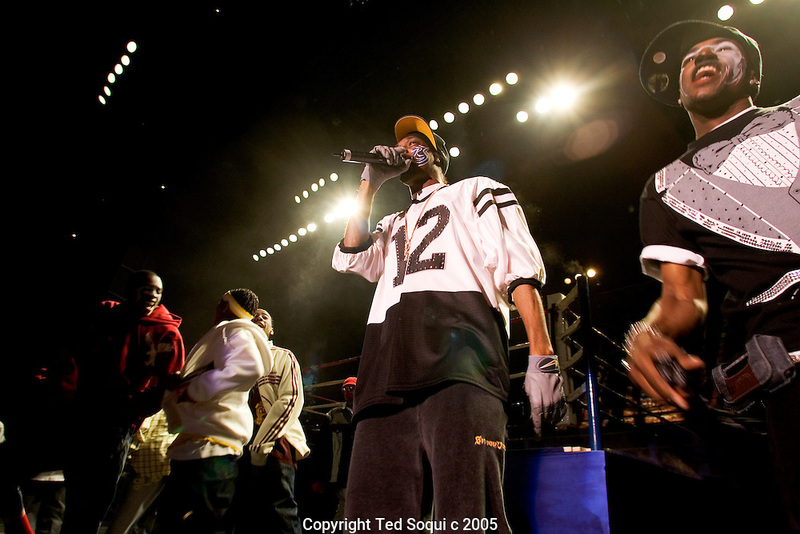 Snoop Dogg performing wearing face paint..Battlezone 2005 held at the Great Western Forum in Inglewood, CA. Krumpers and Clown dancers from South Central LA showcase their dancing skills in a yearly competition. Tommy Johnson, aka "Tommy the Clown" started the Clown dance and Krumping movement in South Central LA as a real alternative to gangs and crime. The high energy Krumping and Clown dancing are hip hop based with African tribal dancing tributes. Face paint is often worn to distinguish the dancers unique dance styles, most are clown like with graffiti accents. The dance movement was made popular by the recent documentary "Rize" by photographer David LaChappelle which featured "Tommy The Clown"..